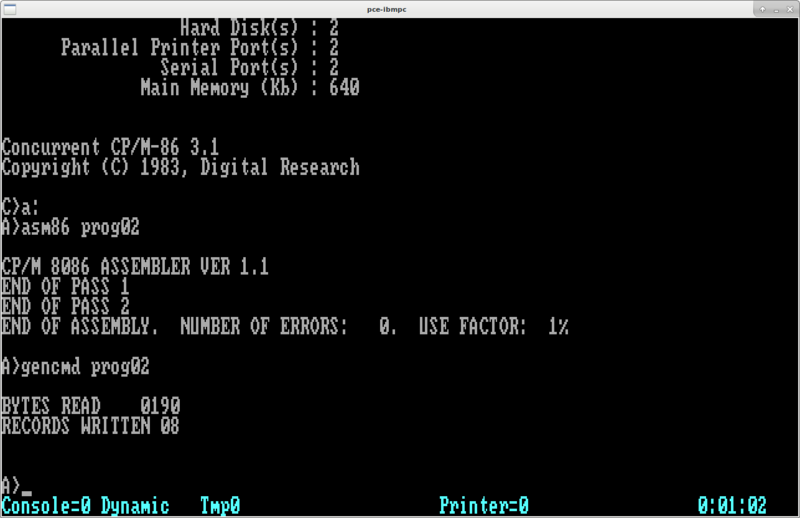 I am trying to learn the 8086 assembly language. So as exercise, I decided to write a hexdump program, that outputs the contents of files in a format similar to Linux hexdump. 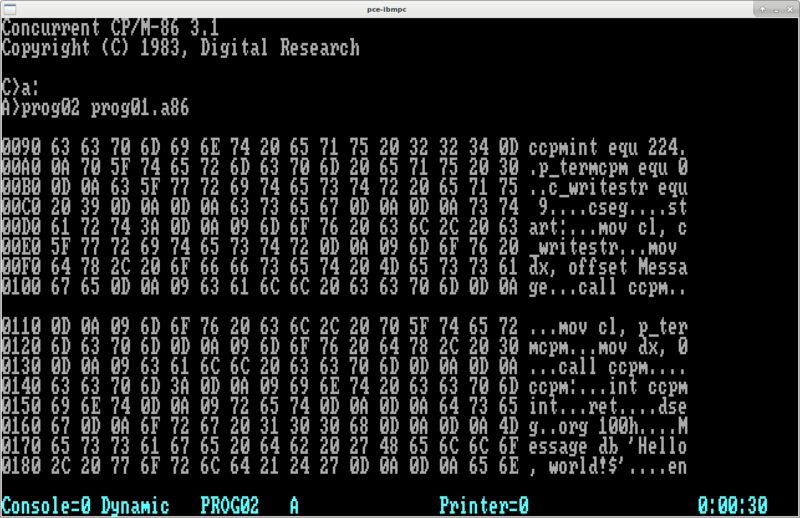 I am developing under Concurrent CP/M 86 inside an emulator. 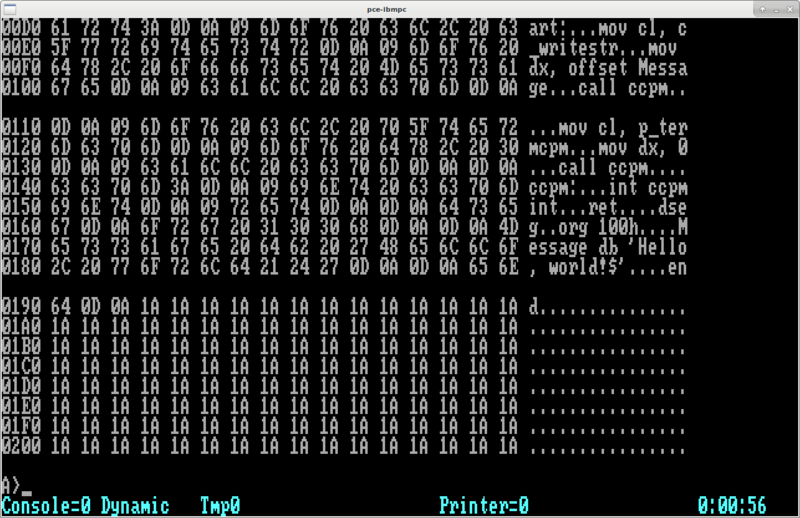 My version of hexdump reads a file name from command line and print the contents on the console. I don't have any experience with the assembly language, so I'm trying to find ways to improve. I still don't know how to structure code and name labels and variables. I'm not familiar with Concurrent CP/M 86 but I do know my 8086. I found it remarkable to see the org 100h directive so far down in your program. I would have expected this almost at the first source line! I still don't know how to structure code and name labels and variables. Apart from my remark about ORG these are actually quite good. You used descriptive names and there's a good ordering of the subroutines. Each time you clear a register (any general purpose register! ), you can do this more efficiently by XOR ing the register with itself. The part where you copy the filename can be much improved by using the movs string primitive instruction. You load the desired amount in CX and then repeat (rep) the operation. The direction flag (DF) is cleared beforehand to force the CPU updating the SI and DI registers moving up in memory. This procedure must process bytes (you raise the addresses by 1), but you read and write words! The test to see if 16 bytes were processed is too complicated. All that is needed is testing CX with 15. See how I reduced the number of instructions by introducing an extra label on top and no longer needing the label at the bottom? A call directly above a ret can safely be replaced by a jmp. But since the target immediately follows, you can just not write the jmp. A simpler way of converting follows. It uses less labels which is a good thing for readability. It uses less jumps which is a good thing for speed.